Sixth form students and teachers spent half term helping two schools in Swaziland as part of an ongoing philanthropic initiative. The group helped to get water flowing to New Thulwane School, the second Swaziland school adopted by Bedales, by digging 250 metres of trenches, installing water pipes and concreting the foundations for the water tower. 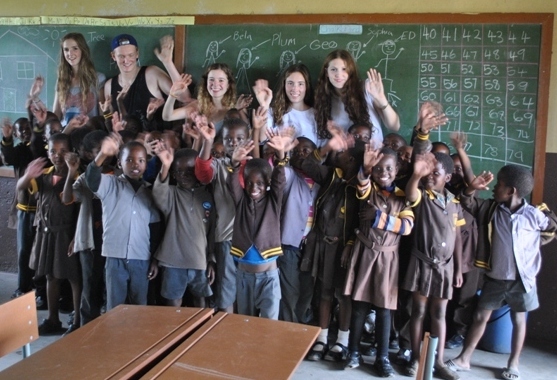 Mbalenhle School, which Bedales has been supporting since 2007, was also visited by the students who helped to paint classroom exteriors, as well as painting a giant world map mural at each of the schools. Students also took part in teaching Maths, English, Geography and Social Studies to pupils. The Swaziland visit was the culmination of a year-long fundraising initiative organised by the students raising a total of £19,000 through various events. Read more. View photos.